While we’re most known for creating beautiful kitchens, we can provide cabinetry and organizational solutions for any room in your home. At the beginning of the year while everyone is focussing on organizing, decluttering and creating good habits that will hopefully last the year one of the rooms in anyone’s home that is often overlooked is the laundry room. Whether you have a large laundry room space, your laundry is a part of your mudroom or back entry or you have a small laundry closet – having an organized laundry space is very important. We believe that laundry rooms should not only be functional with optimal storage, room for hanging, baskets, all of your supplies and more but also, it can be beautiful too! After all, who wouldn’t want to do laundry in one of these gorgeous spaces?! When the work areas in your home are organized and functional, it can make a huge difference in keeping your home tidy and clutter free and wouldn’t we all like a more organized home? If you’re building a new home or renovating, come visit one of our design experts and we can help you create beautiful and functional spaces like these for your own home! 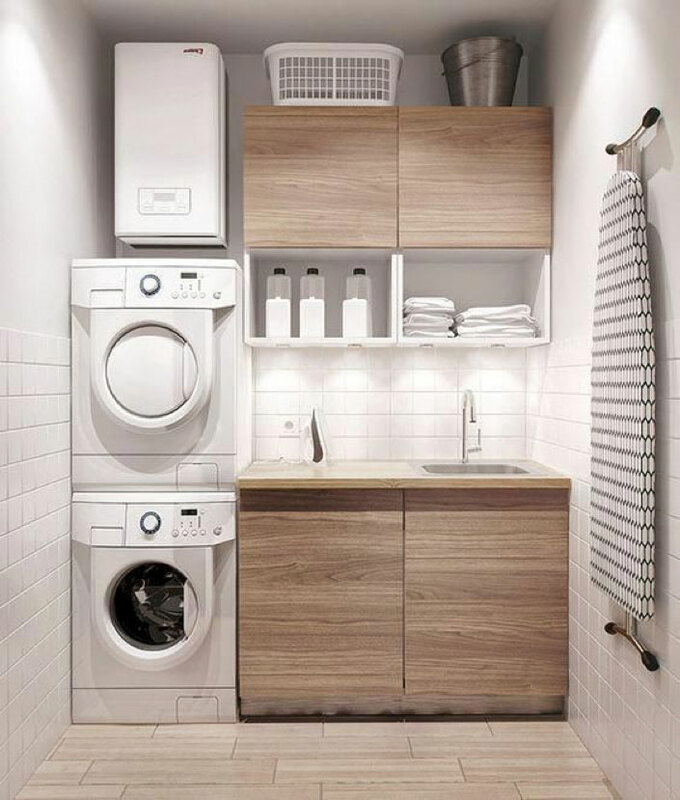 We can’t get enough of this laundry space above! The dark lower cabinets anchor the space but the open cabinetry for baskets keeps the room from feeling too heavy. 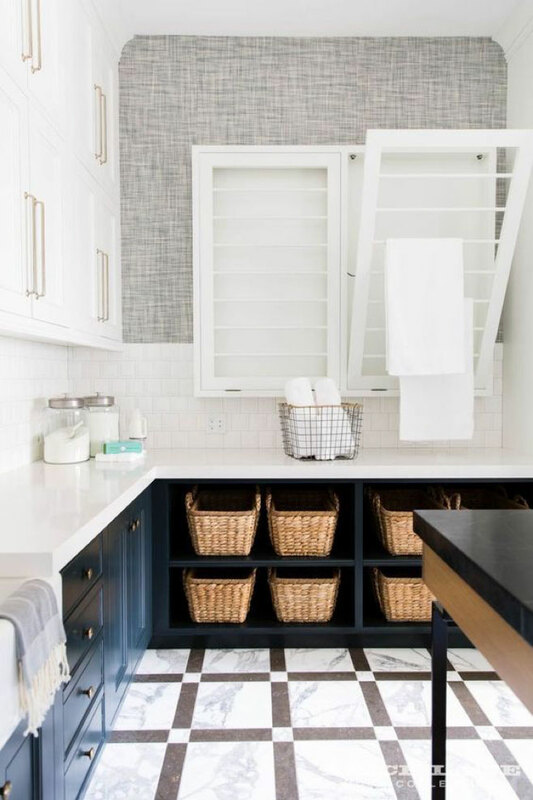 We love the use of two tone cabinetry (read here for more reasons we love this combination) and the light upper cabinetry and pull down hanging racks is a classic choice. 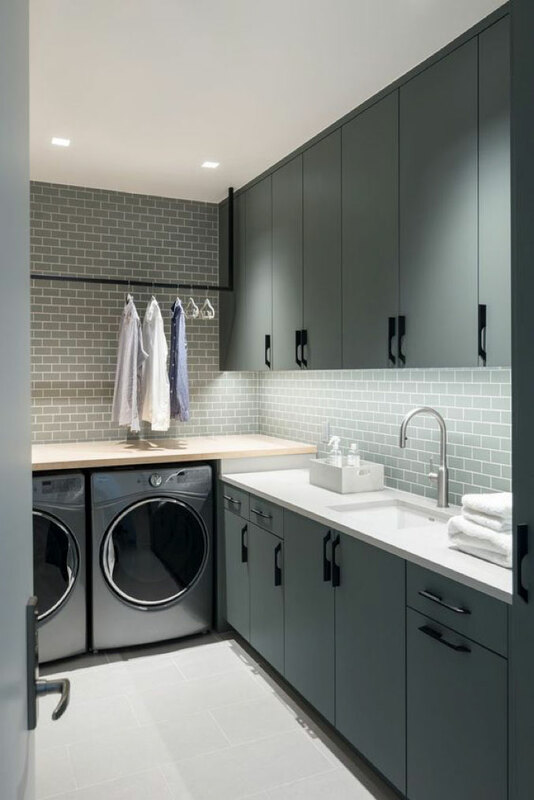 This modern laundry room is functional minimalism at its best! Sleek cabinetry, lots of counter space for folding, a hanging bar to dry and a sink to spot clean make this a room that’s not only beautiful, but functional as well, don’t you think? We love this space as it shows that a smaller laundry area can have lots of storage and look beautiful as well. This sleek scandinavian laundry area uses closed off cabinetry to hide clutter but allows for a bit of display for the most frequently used items. If your laundry area is on the smaller side, take note from this area and take advantage of the walls to hang your ironing board or a drop down drying rack.